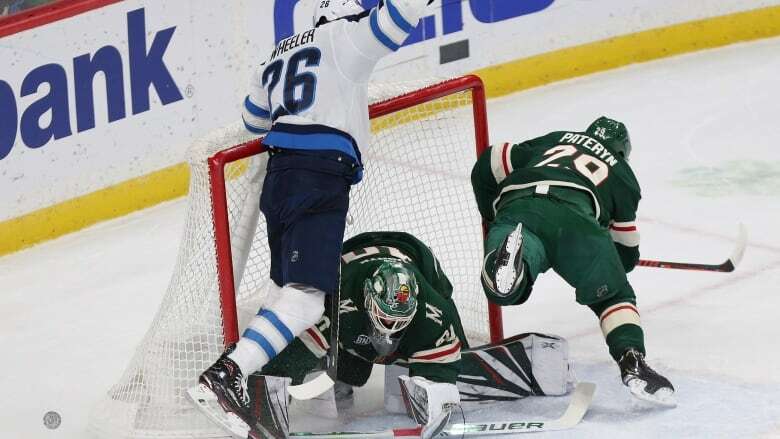 Jason Zucker scored twice and goalie Devan Dubnyk made 26 saves as the Minnesota Wild kicked off a two-game homestand by clinging to a 3-2 victory over the Winnipeg Jets on Thursday night. Jason Zucker is squarely among the skaters Minnesota needs more production from over the second half of the schedule to return to the playoffs, a responsibility that's not lost on him or anyone else on the Wild. After a morning meeting of reassurance from coach Bruce Boudreau, lo and behold, Zucker responded with two goals. Zucker gave the lagging power play a lift with his first score and added another just after leaving the penalty box, both in the second period, and the Wild hung on to beat the Winnipeg Jets 3-2 on Thursday night. "I hate watching you come off the ice looking so down all the time," Boudreau told Zucker in their conversation. "So it's time you had a chance to have some fun." Zucker, who was second on the Wild last season with a career-high 33 goals, scored only once over his previous 14 games. "I've got to do it consistently now. I can't be happy with just one game and a couple goals and shut it back down," said Zucker, who's tied with Mikael Granlund for third on the team with 12 goals. "There's certainly a good possibility of matching up come playoff time if we get there," Dubnyk said, "and as much as the regular season doesn't matter, well, we need these points right now, and it's always good to have a winning feeling in both arenas." The Wild blocked 22 shots and won 36 of 55 faceoffs. "Guys are playing well now," Greenway said, "and not cheating for offense." Brandon Tanev gave the Jets some life with his goal in the final minute of the second period, cutting the lead to 3-1. Then, with Connor Hellebuyck having already vacated the net, Mark Scheifele scored with 2:38 remaining in the game to bring the Jets within one. The Wild went without a shot on goal in the third, the first time in franchise history that happened to them at home in any period. "You allow them to take the lead, it just plays right into their game," Jets captain Blake Wheeler said. The Jets managed just one shot on goal over the first 15-plus minutes of the game, and the Wild actually had a lead to match the effort after Eric Staal fed Greenway from behind the net . This was only the 15th time in 43 games the Wild have scored first. They're 9-5-1 in those instances. The Wild had only one power-play goal in their previous 23 opportunities, all without defenseman Matt Dumba, who's still second among NHL blue-liners this season with 12 goals and ruptured the pectoralis muscle near his right shoulder on Dec. 15. Midway through the second period, with a man advantage for the Wild, a turnover led to a short-handed breakaway for the Jets and a snap shot by Adam Lowry that caromed off the left post. The Wild quickly regrouped after the fortunate bounce and went back the other way for Zucker's score in the waning seconds of Kyle Connor's tripping penalty. "We got to our game in the third period and made things a lot difficult for them in their own zone and challenging pucks to the net," Tanev said. "I think we need to get to that game right away."